The orange carpet rolled out, and the ribbon was cut. After two years of construction, the School of Nursing and Health Studies’ Simulation Hospital officially opened its doors. At five stories and 41,000 square feet, the state-of-the-art building is one of the largest and most advanced simulation hospitals of its kind in the world. 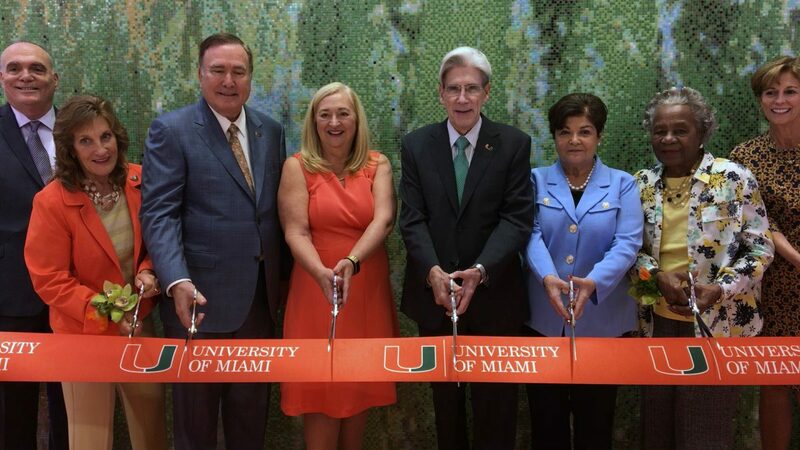 University President Julio Frenk and new SONHS Dean Cindy Munro welcomed more than 250 special guests and the media to highlight the features and benefits of the new facility. 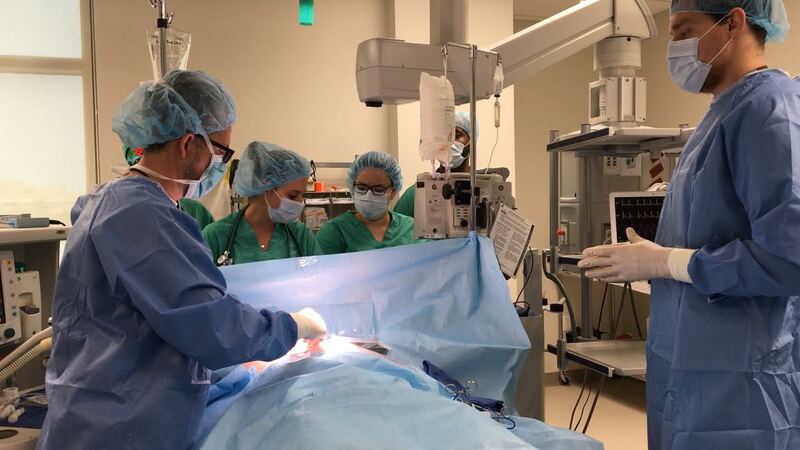 Research shows clinical simulation is the key to improving patient safety outcomes, Munro said, but the facility is more than just a classroom. During the ceremony, guests and media took self-guided tours of the building. 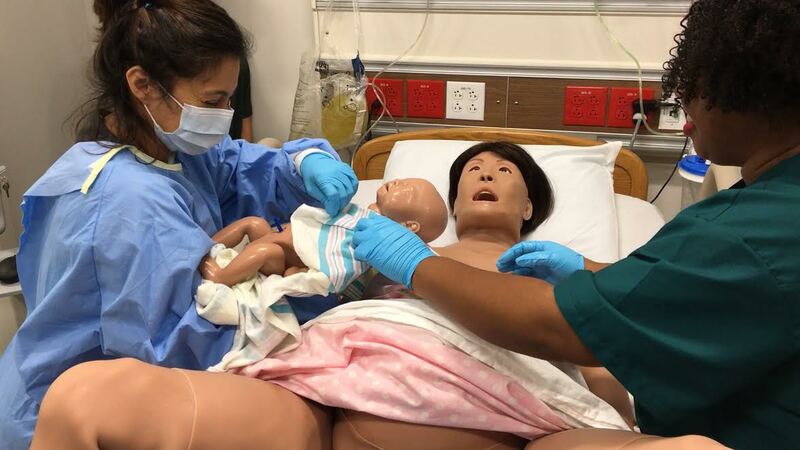 Graduate students presented emergency simulation demonstrations with reactive healthcare mannequins in eight different rooms. The presentations included a birth, resuscitation and fire. On the first-floor care providers illustrated the high stakes of emergency medical scenarios. A “patient” with life-threatening injuries arrives in the emergency department and the students scramble to save him. The simulation patient in question is an electronic mannequin with vinyl skin controlled by a technician behind a computer screen who decides how the scene should play out. The monitor showed vital signs deteriorating as the “patient” went into cardiac arrest. Students acted quickly and collaboratively to revive him. They rushed to deliver CPR and defibrillation shocks. The new hospital illustrates that the future of healthcare is both dramatic and dynamic, Frenk said. “We need a culture of innovation and continuous improvement, and all that is what this groundbreaking facility is going to allow,” he said. The simulation hospital is open to students and serves as an environment where they will test and master skills. First-year nursing student Kacie Robinson said the hospital was worth the wait. Hurricane Irma interrupted the last phase of construction preparations and threatened to delay the dedication ceremony. Frenk related the hospital’s importance to the recent natural disasters in the United States, the Caribbean and Mexico. “This hospital really launches a new vision for health, professional education, and also for disaster preparedness, which we have seen recently is really imperative,” he said. The hospital serves as a center where students and professionals will test and master life-saving skills to revolutionize medical care and technology, including emergency preparation. Former SONHS, Dean Nilda (Nena) Peragallo Montano, attended the ceremony and was credited with providing the vision for the hospital’s construction. In August 2016, Montano announced her resignation and became the dean of the School of Nursing at the University of North Carolina at Chapel Hill. The simulation hospital is also hosting its Inaugural Symposium 9 a.m. to 12 p.m. Sept. 29 in the hospital’s second-floor auditorium. The session, “A Response to the Call for Radical Transformation,” will be a dialogue on real-world challenges and innovative solutions for improved disaster response and patient-care experiences. “We not only open the doors to a new facility but also to new possibilities,” said Edward Erickson, the chief fire officer for Miami-Dade Fire Rescue and current Ph.D. student at SONHS.